Designed and tested to provide 100% clean, dry, oil-free compressed air at -40°c atmospheric dew point, to safeguard your valuable pneumatic equipment. Trident Dryers are available in 19 models to suit your requirement. They work with pressures from 4 kg/cm2(g) to 70 kg/cm2(g) and flow upto 1920 m3/hr. The moisture laden compressed air passes through the pre filter. Here moisture load is reduced through coalesence. Condensation is removed through the drain valve ADV1. At the oil filter (2) oil vapors are removed completely, small levels of oil/water condensation are purged through the valve ADV2. Compressed air is then passed through a 3 way valve into Tower. The Towers are filled with Activated Alumina as desiccant (Molecular sieve available as option). When air passes through Tower 1 which consists of “DRY” Dessicant, it gets completely dried, and passes through check valve and After Filter(3). 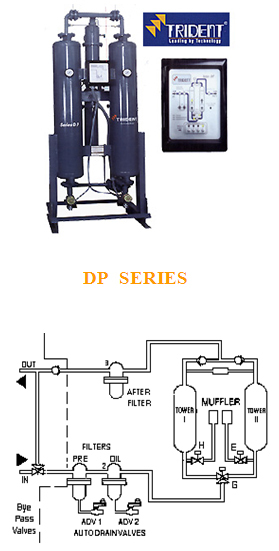 At the after filter, Desiccant fines are removed. Therefore dry compressed air passes out at the outlet. Regeneration takes place in 2 stages a) De-pressurisation b) By passing Dry air. Tower II consists of fully moist desiccant at pressure. This is suddenly De-pressurised by opening the purge valve. Water molecules weep out of the desiccant and appear on the surface. “Super Dry” purge air passes through the Regeneration “Nozzle” and the desiccant bed thereby completely carrying away the water molecules. Tower 2 gets regenerated and is ready for the next drying cycle.